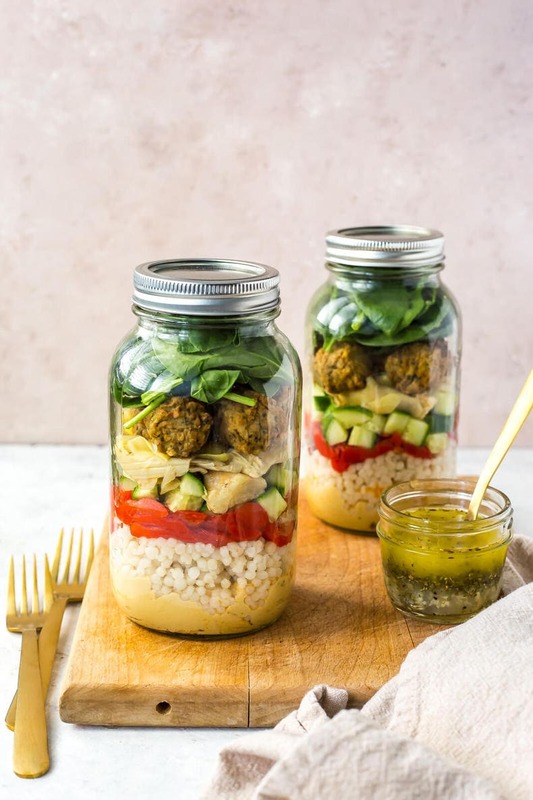 The Ultimate Vegetarian Mason Jar Salad is packed with protein and a delicious hummus base that acts as an extra layer of flavour – try the Mediterranean Falafel version or the BBQ Quinoa version with black beans and diced mangos! This post is sponsored by Sabra Canada. Thanks for supporting the brands I love – they help keep my blog up and running! Okay, can we talk about how amazing mason jars are when it comes to meal prep salads? Today I've got two amazing vegetarian options for you to try out, and they don't compromise on flavour either! I seriously love meal prep like this – it's such a great way to see all the flavours layered within so your lunch looks just as appetizing as it tastes! 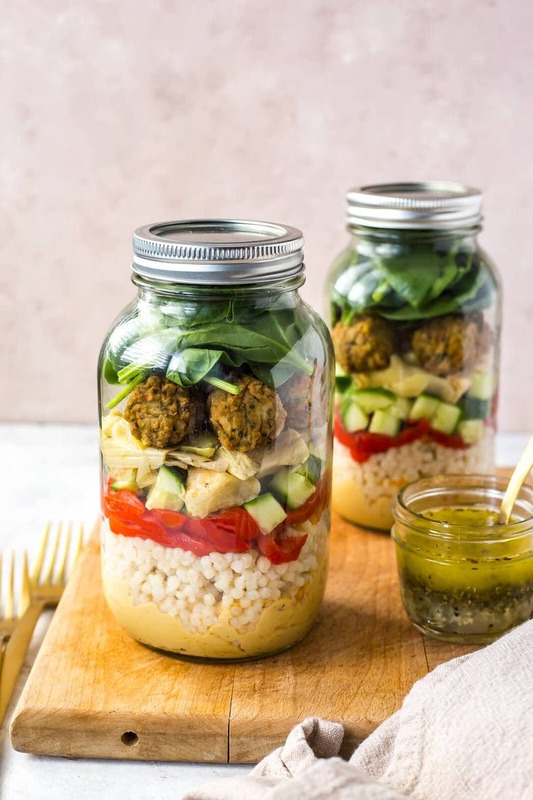 First up are the Taste of the Mediterranean Salad Jars with pearl couscous, roasted red peppers, falafels, cucumber, artichokes and spinach, and then we've got the Sweet & Smoky BBQ Salad Jars with black beans, mango, cherry tomatoes, red onion and arugula. 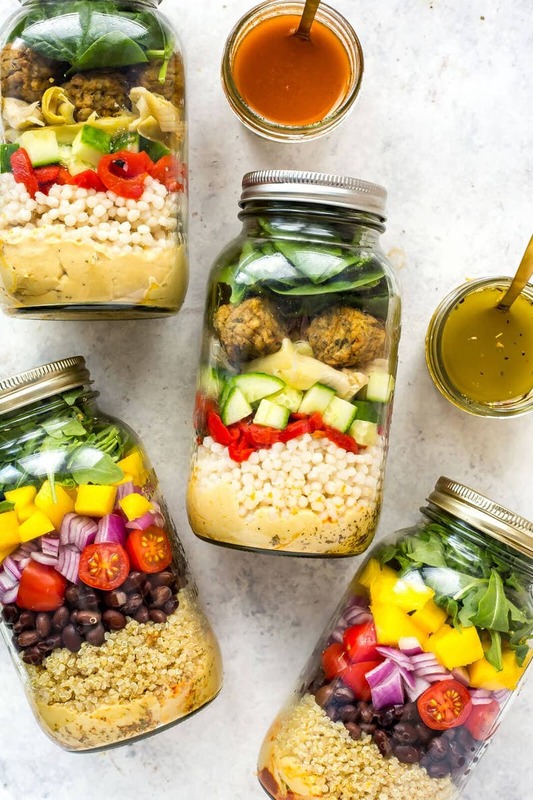 These mason jar salads are meal prep #goals. And did I mention that these salad jars also packed with protein and healthy nutrients from all the veggies? 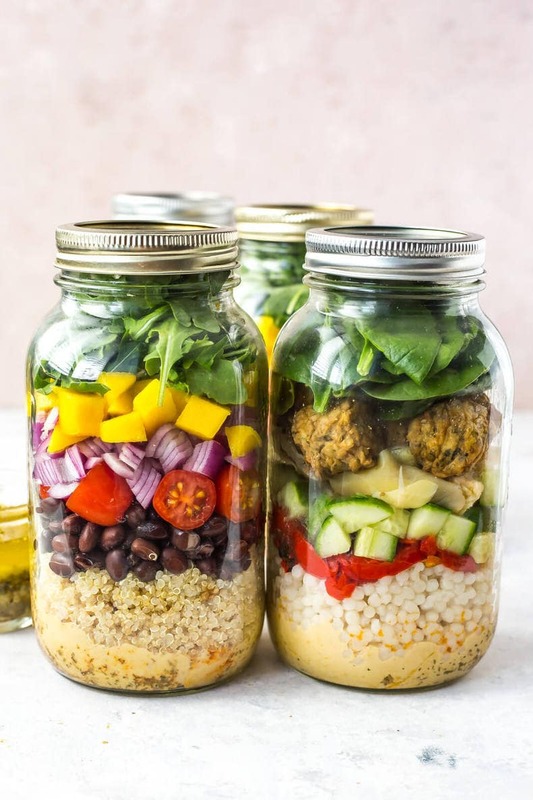 You can rest easy knowing you're taking a healthy, nutritious plant-forward lunch with you on-the-go, and you can prep these jars ahead of time so it really is just a matter of grabbing one out of the fridge. Now I will mention, while these jars save on space in the fridge, they are kind of difficult to eat out of so you may need to pack a bowl with you if your workplace doesn't have a staff kitchen with dishes in it. I'll usually pack a wide, deep bowl (sometimes even just a large Tupperware container) but pour the dressing the jar and shake it with the lid on to avoid a mess. 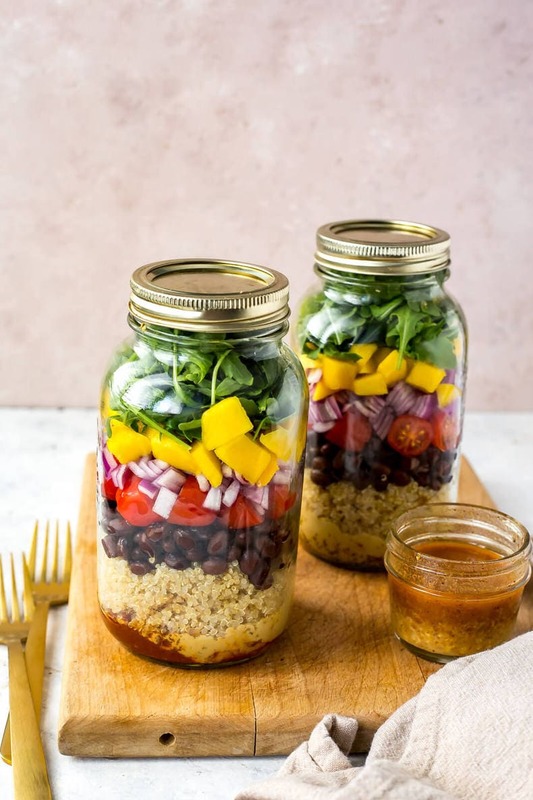 The main benefit of mason jar salads is that you're able to keep the dressing and sauces separate from the veggies so everything stays super fresh and stores well all week long. They're my go-to container for soups and salads, and the bonus is that they are microwave-friendly and dishwasher safe! But beyond all this talk on the benefits of mason jars and meal prep, we really do need to talk about the delicious ingredients in these jars don't we?! 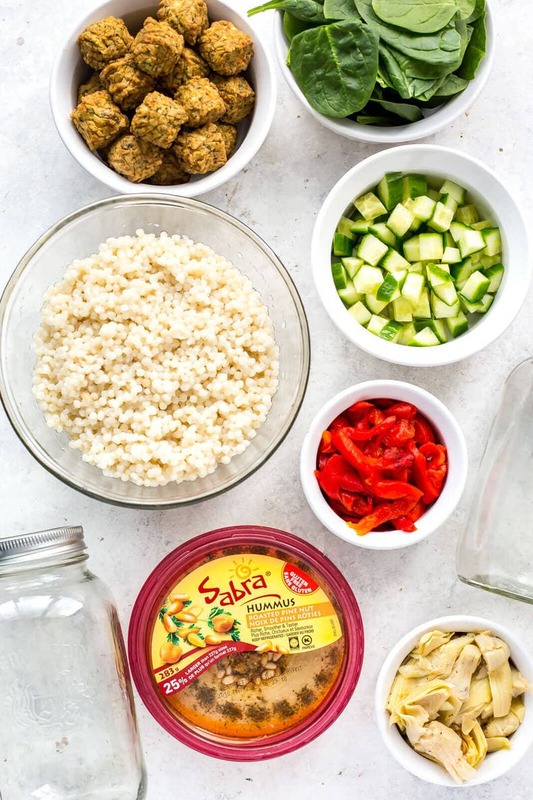 And of course we are starting these plant-forward mason jar salads with my favourite Sabra Canada hummus! Sabra’s tasty, creamy hummus is inspired by Mediterranean recipes and made by hummus experts, but it's really their fun flavours that keep me coming back for more – and the taste!!! Their hummus is my go-to for snacking because there are so many flavour options to choose from, and each one is more delicious than the next. If you remember our Mediterranean nacho bar idea for the Super Bowl, you'll know that they introduced a super delicious taco fiesta flavour that I just went wild for. Well this time, I've decided to incorporate their amazing tasty hummus into these salads! They even hosted a delicious #SabraFeelGoodFood event in downtown Toronto where a bunch of us bloggers got to meet with Sabra's corporate executive chef MaryDawn Wright who is also a hummus expert – she showed us some photos of her touring Israel and other countries tasting all kinds of hummus and stressing how you really can make a whole meal of it. What an amazing job right?! Traveling and “researching” all kinds of delicious food…sign me up! Well, I've partnered with Sabra again to introduce another amazing new limited edition flavour that's PERFECT for summer, and that is their Sweet and Smoky BBQ hummus with Jackfruit and Smoked Paprika (it's available until October 2018). OMG am I ever obsessed! 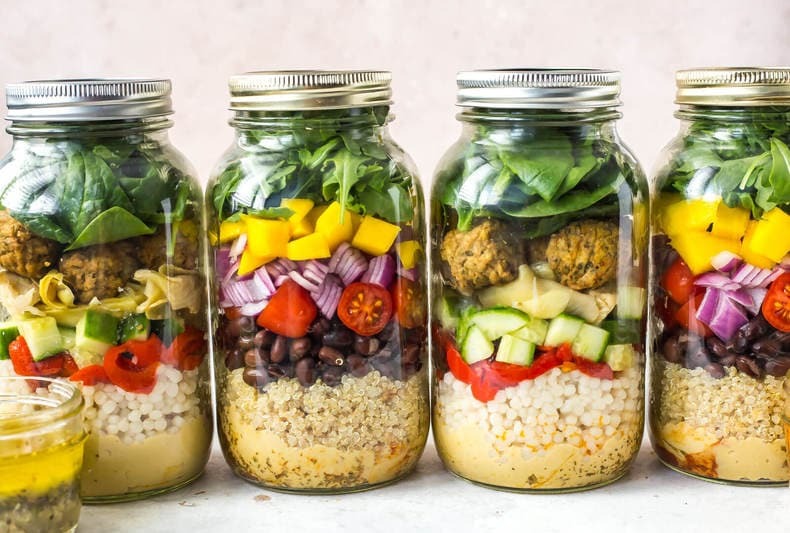 This flavour is so perfect for summer and also touches on the feel good plant-based theme we're going for with these salad jars; what you're taking for lunch can really impact your day in terms of feeling as though you have something to look forward to, and something nourishing. Too often we enjoy salads with dressings that are super high in calories and often add no nutritional value. 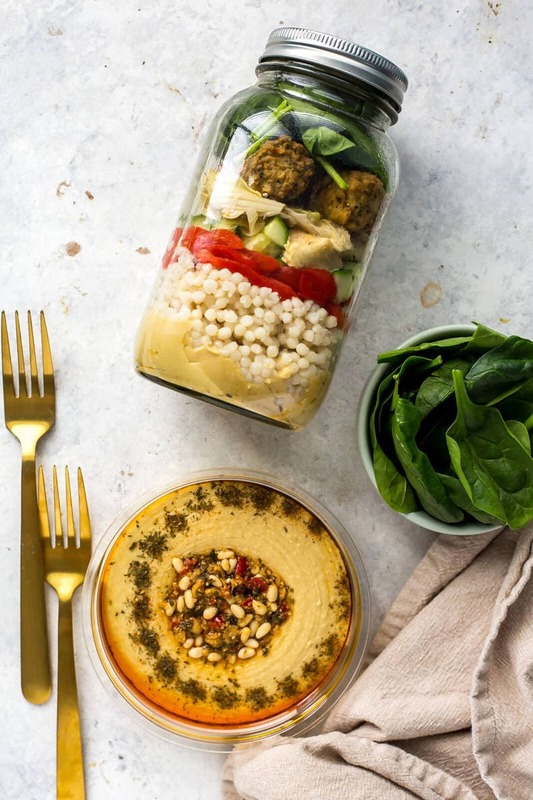 By adding hummus as a key flavour component, you can rest easy knowing you're adding a healthier option to ramp up the taste and you can feel good about what you're eating – plus you're also sneaking some more protein in there too! Now the key to salad jars is not being afraid to switch up the ingredients! If you've got romaine lettuce on hand instead of arugula, go ahead and use it. Same goes for other condiments and toppings in your fridge. I'll add anything from leftover grains and proteins from the previous week's dinners (I almost always have leftover cooked chicken in the fridge) or look through my pantry to find cans of beans, chickpeas or dried lentils. I then take a peek through the fridge to see what fruits and veggies I can add. And you can definitely add in some fun toppings like nuts, seeds, dried fruit, shredded coconut, tortilla strips and more so raid that snack drawer of yours too! See, it's SO easy! Don't be afraid to mix and match…though if I will say so myself, I prefer my falafel and BBQ quinoa versions hehe. 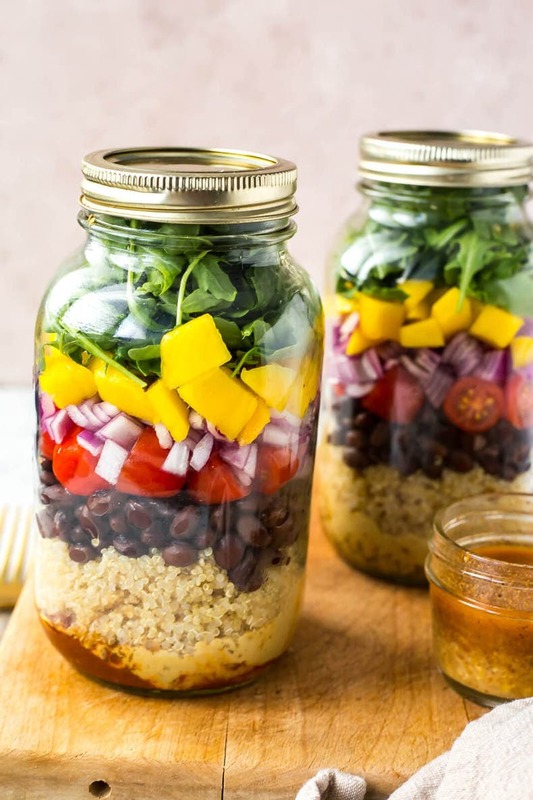 Will you be making this Ultimate Vegetarian Mason Jar Salad? If you do, be sure to use the hashtag #SabraFeelGoodFood to show us your yummy creations! 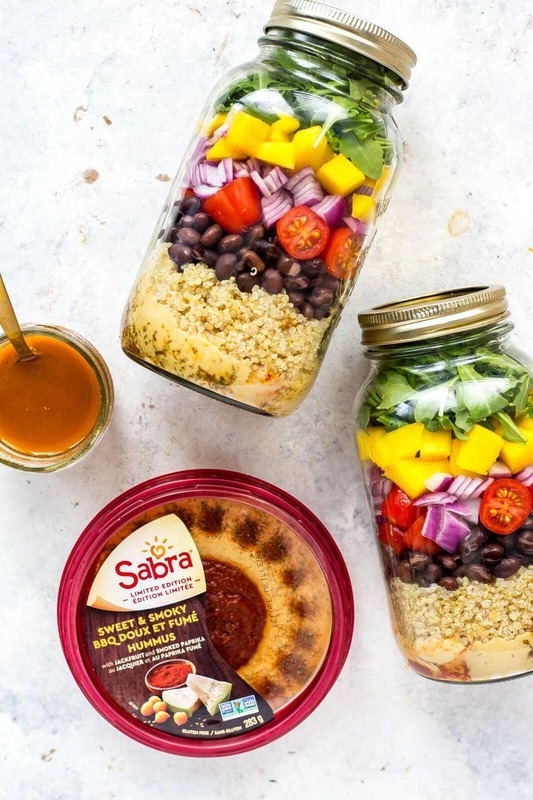 Sabra's yummy hummus products are located in major grocery stores across Canada (go out and get that limited edition Sweet and Smoky BBQ flavour before it's gone!). For more delicious recipes like this one be sure to follow Sabra on Twitter, Facebook, Instagram and http://sabra.com/! 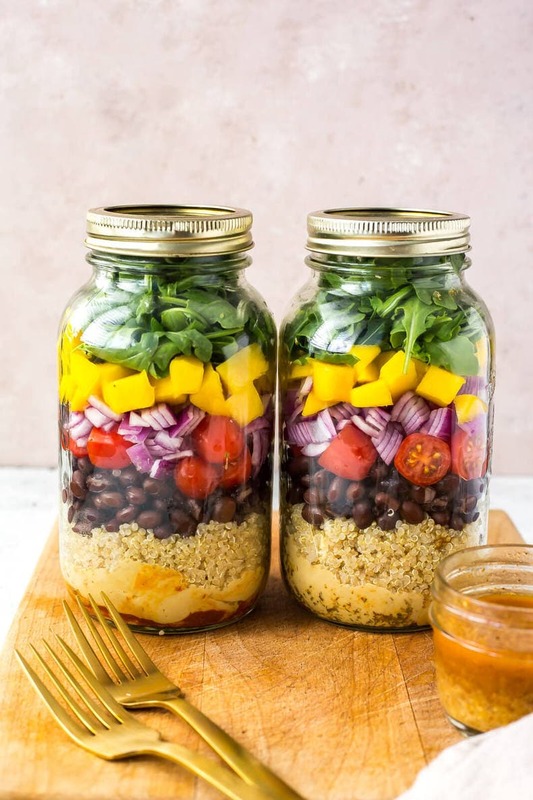 The Ultimate Vegetarian Mason Jar Salad is packed with protein and a delicious hummus base that acts as an extra layer of flavour - try the Mediterranean Falafel version or the BBQ Quinoa version with black beans and diced mangos! Cook quinoa according to package directions (usually about 1 cup dry quinoa with 2 cups water on the stovetop for 10 minutes). Meanwhile, prepare ingredients for 4 (950mL) mason jars. 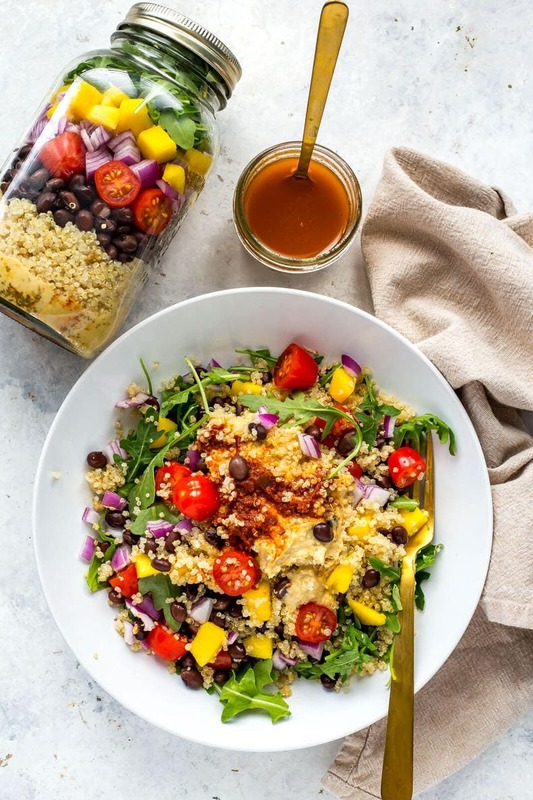 Divide hummus and place in the bottom of each jar, then layer in quinoa, black beans, cherry tomatoes, red onion, mango and arugula. Mix together ingredients for chili lime vinaigrette and pack in separate containers. Serve salad in a deep bowl and toss with vinaigrette. Cook Israeli couscous according to package directions (usually about 1 cup dry couscous with 2 cups water on the stovetop for 10 minutes). Meanwhile, prepare ingredients for jars. 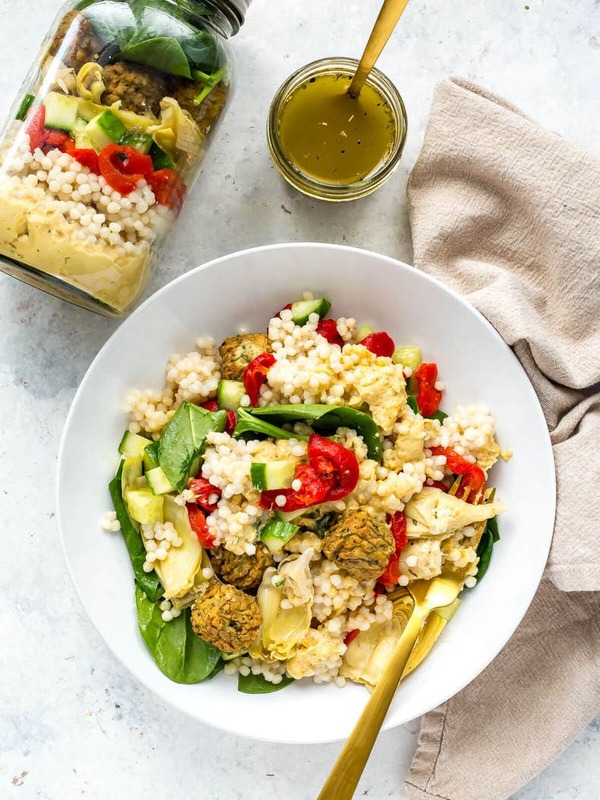 Divide hummus among the bottom of each jar, then layer in couscous, roasted red pepper, cucumber, artichokes, falafels and spinach. Mix together ingredients for lemon vinaigrette and pack in separate containers. Serve salad in a deep bowl and toss with vinaigrette. Looks delicious! All my favorites in them too! Super easy! These look delicious! I’ll have to give them a try, thank you for sharing!